I wanted Bookworm1 to be interested in reading at an early age, but I had NO thoughts of pushing him when I thought he wasn't ready to learn. I have gleeful thoughts of him reading ME books by the time he's four but I'm not holding my breath or anything. I figured I couldn't force reading anymore than I can force potty training. Both seemed out of our reach. However, then I started tracing letters with my fingers as we read. I would follow the words as I read aloud. Soon he figured out that I was reading whatever was on the page. He would randomly point to things and ask, "What dat say, Mommy?" A surge of hope! Then one day I asked him if he wanted to learn a letter. We learned the letter 'A'. The next day we learned the letter 'B' and the next day 'C'. We utilized some reading games from Learning Resources (which I talked about over at 5 Minutes for Books) and now he is enjoying identifying letters all over the place. He is particularly pleased with himself and mommy is just particularly pleased. Enter eeBoo. (Remember them? They created that awesome Read to Me puzzle game that I mentioned before.) They have these Tot Towers with LETTERS on them. Oh yes. A little boy's dream. Blocks to make a tower while pointing out R's and Z's and O's (all in random order - oh yes!). 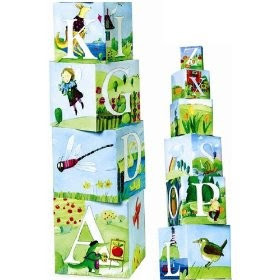 Mommy's dream - a nice looking set of blocks that double as room decor with letters on them for the boy(s) to point out! Fabulous. I DON'T like a lot of clutter around and I DO like things to look coordinated and clean. This Tot Tower is perfect for me, without my feeling like I'm going to trip over countless things or vacuum up little pieces of things I shouldn't. They also stack up within one another for easy storage, in case you'd rather not leave them out and unguarded. They fit into one another very easily and very well. My son is loving stacking and identifying both animals and letters with these blocks from eeBoo. Furthermore, they are well made (as is everything else that eeBoo produces). Solid and sturdy, artistic and imaginative, I think these Tot Towers aren't a half bad idea! In fact, I think they are a very good idea both to decorate and familiarize the little ones with the alphabet. Plus - they are cute and convenient. They make my son want to continue learning his letters. I have nothing but nice things to say about them. Ziva would loves those blocks. She already turns pages in books and peers intently at the words! Woo hoo! Those look great! You're right -- a great combo for boy. I'm sure that he will learn to read quite easily. I don't know how much I've told you, but Kyle just "reads." I didn't teach him. I think that SuperWhy had something to do with it, which you won't know, but it's a TV show. If you can rent some DVDs sometime, you should check it out.